Good news! 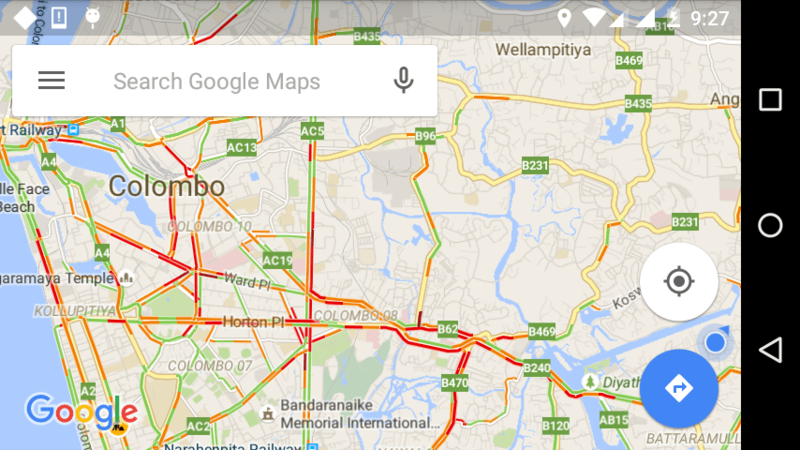 Google maps traffic layer is finally available for Sri Lanka. This is what the traffic layer looks like. The deep red zones indicate areas where traffic is slow moving at a given moment. This screen capture was taken at about 9:40am; which means shortly after the morning rush has ended. Yet many streets most notably the ones around Lipton circus and Rajagiriya still show a deep red. This is in line with the general observation that "There is always traffic there". And that's exactly where road.lk makes a difference. Road.lk users send in their traffic alerts when they find that traffic is moving much slower (or faster) than usual at a particular location. Baseline road might be red every evening on the Google traffic layer but on some evenings it might take about twice as long to pass from Borella to Peliyagoda and that's when our users send in their traffic alerts. Similarly Horton Place and Green Path starts to crawl soon after schools close for the day, it will be a deep red on the traffic map but you don't wont to avoid it because there isn't a practical alternative from Kollupitiya to Borella. Yet on some days the Nelum Pokuna traffic lights might keep you waiting for 10 minutes longer than usual. That's when road.lk users send in their traffic alerts. That way other users immediately know that they could try the equally red tinged alternatives to Horton Place. « The emperors new traffic plan.